Shin Onigashima (新・鬼ヶ島, Shin Onigashima? 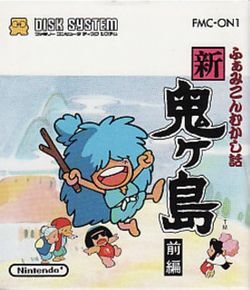 "New Onigashima" ("Onigashima" literally means "Island of Oni (demon)")), fully titled as Famicom Mukashibanashi Shin Onigashima (ふぁみこん昔話 新・鬼ヶ島, Famicom Mukashibanashi Shin Onigashima? lit. "Famicom Fairytales: New Onigashima"), is a video game title originally released for the Famicom Disk System. It was developed by Nintendo EAD and Pax Softnica and published by Nintendo. The driving force behind the series, Tatsuya Hishida of Nintendo EAD, was responsible for directing the game, creating the characters, and crafting the story line. The Disk System version was released on two disk cards. The first disk (Zenpen) was released on September 4, 1987, while the second disk (Kouhen) was released September 30, 1987. As indicated by the game's subtitle, the game borrows heavily from traditional Japanese fairytales such as Momotarō and Princess Kaguya. Most text-based adventure games of the time were written in the style of mystery novels, where the player had to solve a murder or crime of some sort, but Shin Onigashima's fairytale-like plot gave a much softer and accessible feel to the genre. A remake of the game titled Heisei Shin Onigashima was released for the Super Famicom in 1997 and 1998. It was also redone for the Game Boy Advance as part of the Famicom Mini series on August 4, 2004. The Super Famicom version was re-released on the Wii Virtual Console on June 19, 2007. The game was never released outside of Japan. This page was last edited on 2 November 2012, at 03:07.